December 15, 2010 - Bombardier Aerospace on Tuesday showcased the first two CRJ1000 NextGen regional jets destined for launch customers, Air Nostrum of Valencia, Spain and Brit Air of Morlaix, France. During a celebration at Bombardier’s Mirabel, Québec facility, where the CRJ1000 NextGen aircraft are manufactured, the two airplanes sat side by side in the livery of the two long-time Bombardier customers. The delivery teams from both launch customers joined in the celebration. Air Nostrum’s contingent was led by Miguel Angel Falcón, General Manager, Air Nostrum, while Marc Lamidey, Chairman and Chief Executive Officer, Brit Air, led his airline’s team. Several of Bombardier’s senior executives and employees, as well as suppliers, union representatives and media, also attended the event. Air Nostrum has been a Bombardier customer since 1998 and has ordered 19 Q-Series turboprops and 81 CRJ Series regional jets. Brit Air joined the Bombardier family in 1994 and has ordered 49 CRJ Series jetliners. Brit Air was also the launch customer for the CRJ700 regional jet. Both Mr. Lamidey and Mr. Falcón based their positive expectations for the CRJ1000 NextGen aircraft on their experience with Bombardier’s smaller regional jets. “Their cost of operation, reliability, wide passenger acceptance and ability to offer seamless connection to Air France/KLM mainline flights are all major plusses,” said Mr. Lamidey. “The larger CRJ1000 NextGen aircraft can only help to enhance these competitive advantages by helping to reduce our expenses through lower seat-mile costs while increasing passenger comfort and providing high quality, efficient, and cost effective point-to-point service.” Brit Air has said that it plans to deploy its first CRJ1000 NextGen aircraft on the Lyon-Rome sector during the upcoming holiday season. The CRJ1000 NextGen regional jet, the newest and largest member of the aircraft family that pioneered regional jet service in 1992, first flew in prototype form on September 3, 2008. The airplane builds on Bombardier’s practice of analyzing customer requirements and having the right aircraft available at the right time, as exemplified by the 50-seat CRJ100/200, 70-seat CRJ700 and 88-seat CRJ900 aircraft, which were all developed in response to customer needs. Introduced specifically to meet the needs of growing regional airlines for jets of up to 100 seats, the CRJ1000 NextGen regional jet offers superior economics, with low operating costs and improved cabin comfort. With up to 14 per cent reduction in operating costs when compared to its current competition, the CRJ1000 NextGen aircraft is the optimized solution in the regional airline industry for medium-haul route applications and as the replacement of older-generation, narrow body aircraft in thin markets. The CRJ1000 NextGen aircraft is also the “greenest” member of the CRJ Series family of regional jets. Over a typical 500 nautical mile mission, the 100-seat CRJ1000 NextGen aircraft will consume as little as 3.33 liters of fuel per 100 kilometers per seat. It will produce 85 grams per kilometer per seat of CO2, setting a new standard for 100-seat class regional jets. The CRJ1000 NextGen regional jet is a minimum-change design evolution from the CRJ900 NextGen aircraft. The aircraft’s fuselage has been extended by 2.95 meters (116 inches), and its wing area has been enlarged by a 7.5 per cent trailing edge extension and a 0.66-metre (26-inch) wing tip extension. The CRJ1000 NextGen aircraft also features a new control-by-wire rudder system, new carbon brakes technology and larger forward and aft baggage compartments. While powered by the same GE CF34-8C5 engine family used on the CRJ700 NextGen and CRJ900 NextGen aircraft, the engines on the CRJ1000 NextGen aircraft are available in three thrust variants offering up to five per cent greater thrust. The avionics suite on the CRJ1000 NextGen aircraft has also been upgraded with an improved flight management system and new Rockwell Collins Pro Line 21 digital radios. The CRJ Series family of aircraft has become the benchmark for regional jet efficiency in the 50- to 100-seat segment and is the optimized solution for medium-haul and point-to-point routes that cannot economically sustain larger mainline jet aircraft. As a result, Bombardier has recorded orders for 1,709 CRJ family aircraft, with 1,606 delivered to airline customers around the world as of October 31, 2010. 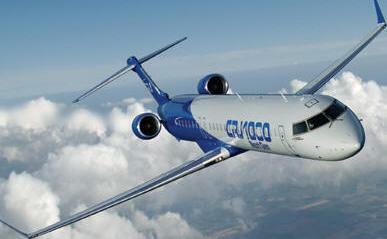 CRJ Series aircraft are in service with more than 60 airlines. The fleet has logged approximately 28 million flight hours and 23 million take-offs and landings. In addition, more than 30 operators have opted for corporate variants of these aircraft. Bombardier is a world-leading manufacturer of innovative transportation solutions, from commercial aircraft and business jets to rail transportation equipment, systems and services, Bombardier Inc. is a global corporation headquartered in Canada. Its revenues for the fiscal year ended Jan. 31, 2010, were $19.4 billion.